Last Wednesday, the Secondary campus kicked off the first of its annual House days by celebrating Kirrane with a feast of green, just a few days short of St Patrick’s Day. 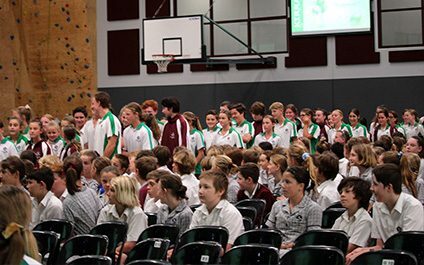 Students in Years 7-12 in Kirrane were invited to wear their green House shirts on the day and treated to a welcoming reception and priority seating for Assembly – entering the gymnasium to applause and the rousing anthem ‘Paint the Town Green’ by The Script. When 1.6 million children around the world protested recently about climate change, our Student Council were also keen to give students at the College an opportunity to make an impact. 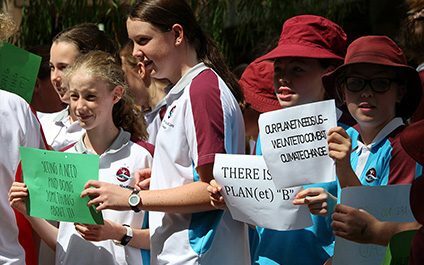 In the Secondary Campus during Monday lunchtime, Year 12 student Eva Burkhardt organised a protest and a minute of silence in the main quadrangle, as a small contribution to this global action. From Monday the first of April, the College will be trialling a part time addition to the Library team. His name is Chief, and he’s a two year old labradoodle. Chief will be at the College one day per week as a Wellness Dog, giving students and staff opportunities to benefit from the support of animal companionship. In our first Primary Assembly on Friday 8 March, Mr Fabre’s Room 17 shared some interesting classroom activities they had been engaged in so far this year. Each student presented an individual ‘avatar’ they had designed to represent their personal identity, which was the main topic in Health this term. A team of four Year 8 students from St Mary MacKillop College won the Junior Tournament of the SunSmart Schools Tennis Classic on 1 March, earning them an invitation to compete in the State tournament in Perth. 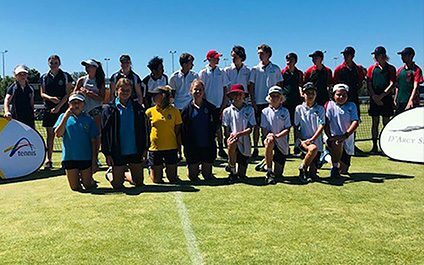 Samuel Newland-Gleeson, Ben Luplau, Jett Watts and Jasper Reynolds all played extremely well in the Herbert Edwards Cup on the Friday at the Bunbury Tennis Club, taking out the trophy against a number of South West schools. 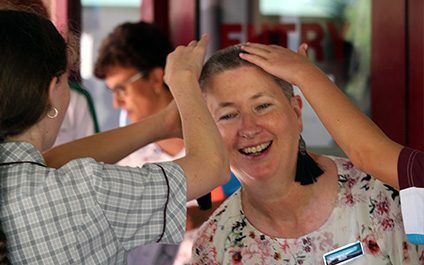 Like many other people, I have family and friends who have lost their hair during chemotherapy treatment. I am always inspired by their courage. I was contemplating having a significant hair cut at the end of the summer holidays so I thought, why not raise some money at the same time. 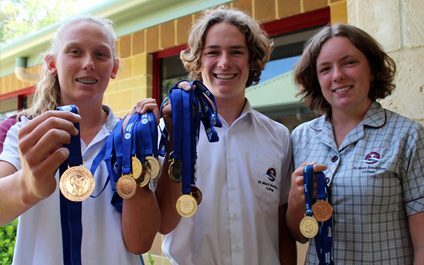 Year 11 student Lucy Hill returned from the Surf Lifesaving WA State Championships in Perth over the weekend with a Bronze medal in the 2km Beach Run and 6th place in the Board Rescue. Lucy also made it through to the finals in the under 17 Board, Surf and Ski races, as well as the Ironwoman. 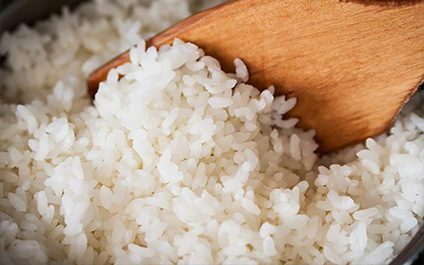 The Primary campus participated in Rice Day on the first Friday of Lent, in consideration of the many people around the world who have so little to eat on a daily basis. Students were encouraged to donate $2 to participate in Rice Day, experiencing what it feels like to have only one bowl of rice to eat. 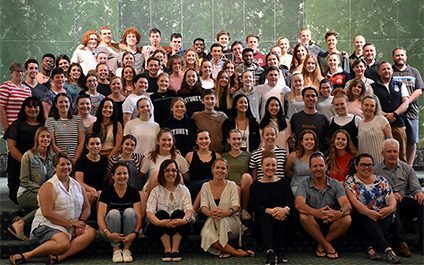 Recently our Head Boy and Head Girl travelled to Sydney to attend the annual JJAMM Student Leadership Conference for the first time. 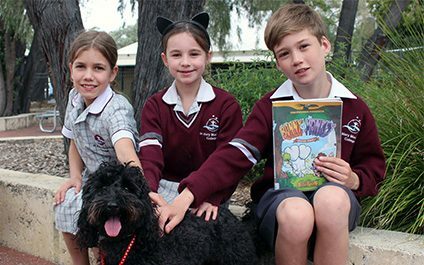 This is a national event for Sisters of St Joseph schools, and focuses on the leadership qualities of St Joseph, Julian Tennyson Woods and Mary MacKillop. 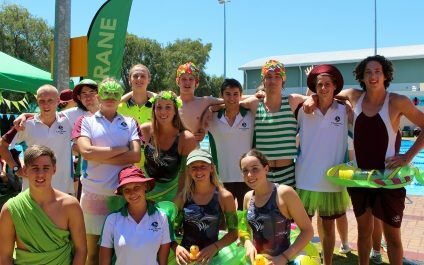 Well that’s a wrap for our 2019 Swim Carnivals and what amazing days they were in their own way. 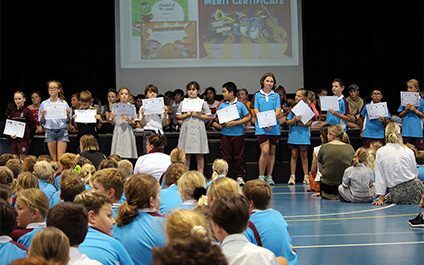 Students in the Year 5-8 Carnival produced an atmosphere of fun and participation, while the Senior Carnival was a day of enthusiasm and celebration. The involvement of staff, parents and students of all ages made both carnivals memorable.